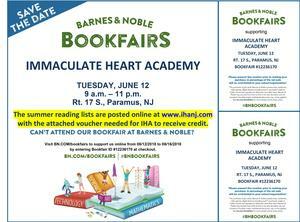 A Barnes & Noble Bookfair supporting IHA will be held Tuesday, June 12 and online from June 12-16, 2018. IHA’s Day of Giving was May 3, 2018. Our Spring Open House will be held on May 2, 2018 from 6:30-8:30 p.m. Please join us at IHA's 4th Annual Powderpuff Tournament benefitting Coach Bob Rhein in his fight against cancer. IHA's Spring Drama production, "You Can't Take it with You," will be held April 26-29, 2018. On April 22, 2018, Immaculate Heart Academy will host our Hall of Fame luncheon, an afternoon to honor several distinguished members of our IHA family. The senior class is once again sponsoring its popular school-wide talent show this Thursday, April 12 at 7 p.m. in the PAC. IHA's 9th Annual Father/Daughter Dance will be held Sunday, March 4, 2018 from 12-4 p.m. at The Venetian. The Annual Fund is comprised of unrestricted gifts used to support our mission of providing an outstanding, affordable Catholic education to young women. IHA alumnae, please join us at a joint Traveling Plaid event with alumni from St. Joseph Regional High School in Montvale.